J.R.Poulter has worked as a senior educator, librarian, lecturer in English Expression, editor and in a circus. A multi-awarded author/poet with over 40 books to her name, she also writes poetry, YA and general readership fiction under J.R.McRae. 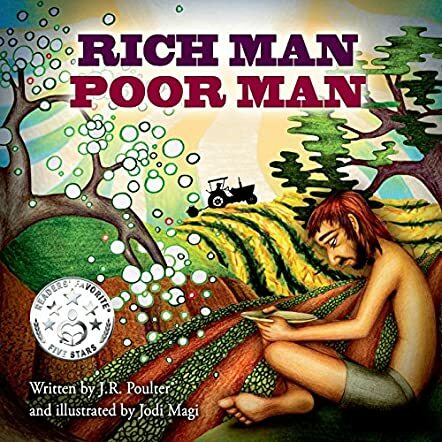 Rich Man, Poor Man is a children’s picture book, written in rhyme by J.R. Poulter and illustrated by Jodi Magi. A homeless man with nothing feels worthless, while looking up higher on the hill and seeing a man who is starting a garden. The man with the fledgling garden feels worthless when he looks up higher on the hill and sees a man who is harvesting his field. That man, in turn, feels like he has accomplished nothing when he looks at the top of the hill and sees a man relaxing in the shade, as his servants turn the soil on his plantation, getting ready for another bountiful year. When looking down, the rich man sees the homeless man at the bottom of the hill. He goes to the homeless man, gives him some fruit from the trees on his plantation, and offers him a job. This is quite a remarkable tale. J.R. Poulter’s story of a poor man who envies a man who has more, regardless that he is doing quite well on his own, is one of jealousy and desire. The actions of the man at the top of the hill - knowing that he has more than he knows what to do with, yet sees a man truly down on his luck and offers him a job - filled my heart with joy. Such a selfless act is worthy of praise and reward, although the rich man expected nothing, but offered the homeless man what he so desperately needed in order to get by ... a job. I believe that many children will think hard and deep about the meaning behind this well told tale, with most of them absorbing the lesson it teaches, going out and making the world a better place by helping those less fortunate. The graphics were equally mesmerizing, and together create a book which children will cherish and be proud to pass on to their own children as they get older. I fully recommend Rich Man, Poor Man to all youngsters over the age of four years, so that it might ingrain a sense of doing the right thing, putting a poor person’s needs ahead of their own.